issues certificates to the elevators, escalators, elevating platforms for people with disabilities. Why is Elevator Certification required? -	Any manipulations related to operation of the elevator equipment. Only accredited organizations can certify elevators. Accreditation certificate confirms the Certification body’s conceptual and practical foundations in implementation of certification and the existence of needed documents. -	Mandatory certification of platforms for persons with disabilities. ANOSLE “Center – Expert” - is the accredited elevators, escalators and platforms for persons with disabilities Certification body. 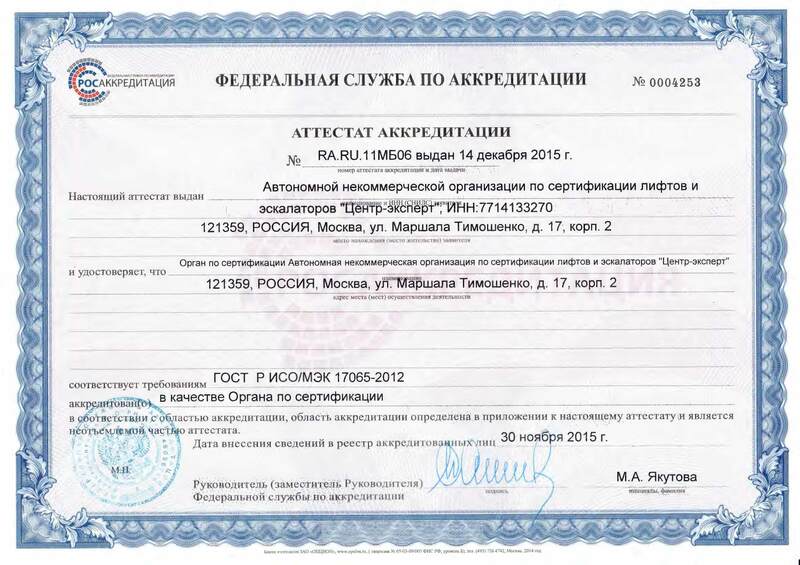 Accreditation certificate RA.RU.11МБ06 date November 30, 2015, issued by Federal Accreditation Service. You can find our contacts here. Ноw to apply for the Certification? You can find out in details how to apply here. Autonomous non-commercial organization for the Certification of elevators and escalators ANOSLE “Center-Expert” certifies equipment since October, 1998 right after the Gosstandart of Russian Federation regulation № 5 “Nomenclature of goods and services (works) in respect of which foreseen their obligatory certification” was issued. Elevators were certified in accord with national legislation GOST R until 2013. On February 15, 2013 the Technical Regulation of the Customs Union TR TS 011/2011 Elevator safety entered into the force. It establishes uniform requirements to organizations which produce, engineer, install, operate, modernize and dispose elevators. There is an indispensable requirement in the Technical Regulation to immediately terminate the use of elevator after expiration of its lifetime stated in its technical certificate. If the technical certificate does not contain any data about elevator’s lifetime, Regulation defines a durability of 25 years from the date of commissioning. It means that lifetime cannot be prolonged without modernization. Hoist equipment must be certified in accord with the Technical Regulation’s requirements on one of the settled schemes. What the certification schemes are? 1С — for elevators of mass production - Accredited testing laboratory tests and measures elevators. The Certification body examines the state of production flow and issues the Certificate of conformity. 3С — for one-time manufactured consignment. 4С — for single manufactured product or consignment. Registration period for new, as well as for modernized, elevators is 10 days. After all tests and verifications have been passed a certificate will be issued in a month. What to do if elevator’s lifetime is expired? In Russian Federation there are a lot of outdated elevators, which cannot be modernized or replaced rapidly. The Technical Regulation allows to use old elevators after official examination of their technical condition. Examination, as well as Certification, is not made for free, that is why owners prefer to stop and then replace their elevators.